Current recommendation for chest compressions in neonatal resuscitation is to use a coordinated 3:1 ratio of chest compressions to ventilations (C:V), interrupting every third compression to deliver an assisted ventilation. Despite this recommendation, the evidence is still unclear on the optimal C:V ratio for use in neonates. Our team has previously reported a novel technique of sustained inflations with chest compressions (SI+CC) reduces time to return of spontaneous circulation and improves hemodynamic recovery. The objective of this study was to determine differences in hypoxic injury and oxidative stress markers of heart and lung in piglets resuscitated with SI+CC compared to a coordinated 3:1 C:V. We found that the SI+CC technique reduces oxidative stress in lung tissues and cumulative oxygen exposure with no differences in hypoxic injury. Our findings lend further support to transitioning this technique to neonatal resuscitation practice. Most newborn infants successfully transition from fetal to neonatal life . However, approximately 10% of near-term and term deliveries will require some form of respiratory support during fetal to neonatal transition, whereas infrequently some newborns (~0.08%) will require aggressive interventions such as chest compressions (CC) or epinephrine administration [1-3]. Neonatal resuscitation guidelines recommend CC if the heart rate remains <60/min despite adequate positive pressure ventilation . Further, the guidelines recommend using a coordinated Compression: Ventilation (C:V) ratio of 3:1 if CC are needed. This approach is composed of 90 CC and 30 inflations per minute, with a pause after every 3rd CC to deliver one effective ventilation. However the most effective C:V ratio in newborns remains undetermined. Neonatal heart rate <60/min implies the inability of the heart to contract strongly enough to pump blood through the body and adequate oxygen delivery . The aim of CC is to mechanically pump oxygenated blood through the body including the hypoxic myocardium until the myocardium becomes sufficiently oxygenated and recover with spontaneous function . Achieving the return of spontaneous myocardial function as quickly as possible minimizes cellular and organ damage and is defined as return of spontaneous circulation (ROSC). Hypoxia and asphyxia depress myocardial function and promote maximal vasodilation with very low diastolic blood pressures leading to severe cellular damage. However, reperfusion and reoxygenation also cause significant cellular damage, and generate oxidative stress [4,5]. Dannevig et al. recently reported tissue genes levels of lung inflammation in severely asphyxiated newborn piglets resuscitated either 21% or 100% oxygen . The current neonatal resuscitation guidelines recommend the use of 100% oxygen if CC are needed in newborn infants . The resuscitation with 100% oxygen is associated with increased oxidative stress (e.g. increased lipid peroxidation in the brain and lungs [5,7]), increased mortality, and worsened neurological outcomes [7-9]. We recently demonstrated that superimposing CC with sustained inflation (CC+SI) compared to 3:1 C:V in a piglet model of neonatal asphyxia significantly improve ROSC, mortality, as well as hemodynamic and respiratory parameters [10,11]. Although we observed significantly improved short-term outcomes using CC+SI, the effect on cellular or hypoxic damage and oxidative stress remains unanswered. The objective of the current study was to determine differences in hypoxic injury and oxidative stress markers of heart and lung in piglets resuscitated with either CC+SI compared to 3:1 C:V. We hypothesized that hypoxic injury and oxidative stress markers would be lower in the CC+SI group compared to the 3:1 C:V group. This study reports secondary outcomes of a randomized controlled biomedical trial that compared two approaches of CC using a swine model of neonatal asphyxia . A total of 20 mixed breed piglets (age 1-4 days) with weight ranges of 1.6-2.1 kg were used in the original study. The piglets were obtained on the day of experimentation and the preparation began after acclimatization to the laboratory environment with no housing and husbandry requirements within our laboratory. These experiments were conducted in adherence to the guidelines of Canadian Council of Animal Use and the University of Alberta Animal Use and Care Committee approved the study protocols. Reporting of results is and has been in accordance with the ARRIVE guideline for animal research reporting . Our animal preparation protocol has been previously reported . Briefly, as stated in our previous report  the preparation consisted of anesthesia with approximately 60-90 minutes of surgical instrumentation. A 60-minute recovery period followed instrumentation to allow physiological stabilization of the animals. Treatment groups were randomized to three groups: sham-operated (n=4), 3:1 C:V group (n=8), or CC-SI group (n=8). Piglets were randomized to receive either coordinated CPR with 3:1 ratio or CC+SI. All piglets were exposed to 45-minute normocapnic hypoxia. 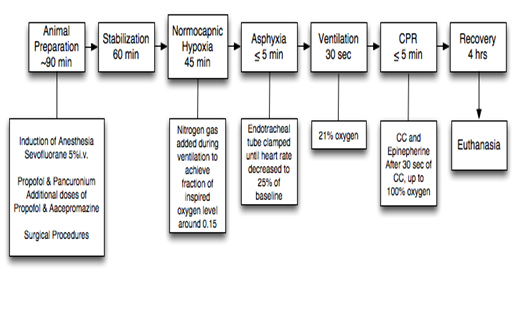 Hypoxia was followed by an asphyxia period until heart rate decreased to 25% of baseline, which was achieved by disconnecting the ventilator and clamping the endotracheal tube. 15 seconds after heart rate reached 25% of baseline positive pressure ventilation was commenced for 30 seconds with a Neopuff T-Piece (Fisher & Paykel, Auckland, New Zealand). The default settings were a peak inflating pressure of 30 cm H2O, a positive end expiratory pressure of 5 cm H2O and a gas flow of 8 L/min. CCs were performed using the two-thumb encircling technique by a single operator (GMS) in all piglets. A Metronome was used to achieve the targeted CC rate. After 30 seconds of CC, 100% oxygen was commenced. Epinephrine was administered if no increase in heart rate or ROSC was observed despite adequate ventilation and CC. At 1 minute after CC were commenced, epinephrine (0.01 mg/kg per dose) was given intravenously and then every minute as needed to a maximum of 4 doses. ROSC was defined as an increase in heart rate >150/min for 15 seconds. After ROSC piglets were allowed to recovery for four hours before the piglets were euthanized with an intravenous overdose of phenobarbital (100 mg/kg). The sham-operated group was randomized to the same surgical protocol, stabilization and equivalent experimental periods with no hypoxia, asphyxia nor resuscitation. CPR in the 3:1 group was performed according to the current resuscitation guidelines with 90 CC per minute and 30 inflations. Piglets randomized to the SI group received a SI with a peak inflating pressure of 30 cm H2O for the duration of 30 sec. During the SI, chest compressions with a rate of 120 per minute were provided. SI was interrupted after 30 sec for one second before a further 30 sec SI was provided. CC were delivered continuously until ROSC was achieved . Tissue samples (including left ventricle and right lung) were taken at the end of experimentation and snap frozen in liquid nitrogen and stored at -80°C until required for biochemical analysis. Figure 1. Study protocol flowchart, sham-operated piglets were instrumented, but did not receive hypoxic or reoxygenation treatment. The sample size for the nested biochemical analysis reported here was limited by the outcomes for our previous CPR study. Only those piglets surviving to the end of the 4-hour recovery period were suitable for comparison in this study. The resulting sample sizes were: sham-operated (n=4), 3:1 C:V group (n=3), and CC+SI group (n=7). Determination of lactate and glutathione were used as surrogate markers for hypoxic damage and oxidative stress, respectively. Protein was determined to calculate total value per mg of protein to equate the individual results. Lactate was measured using an enzyme assay for absorbance of NADH at 340 nm (Sigma-Aldrich Canada Ltd., Oakville, ON). Tissues for lactate assay were prepared by homogenization in a 6% perchloric acid with 0.5 mM EGTA and then neutralized after separation with 5 M potassium carbonate. Both total glutathione (GSH) and oxidized glutathione (GSSG) were measured using a commercially available ELISA kit (#703002, Cayman Chemical, Ann Arbor, MI). Tissues were homogenized in a 0.1 M phosphate buffer solution (pH 7.4). GSH and GSSG were then assayed according to the assay kit instructions, with GSSG assayed by derivatizing GSH in the sample preparations with 2-vinylpyridine solution (Cat. #13,229-2, Aldrich Chemical Company, Milwaukee, WI). Protein determination was measured using the bicinchoninic acid method using a bovine serum albumin standard and absorbance measured at 560 nm (Sigma-Aldrich Canada Ltd., Oakville, ON). All assay absorbance readings were measured using a Molecular Devices Spectramax 190 Absorbance Microplate Reader (Molecular Devices, LLC. Sunnyvale, California, United States). Where paO2 is partial alveolar pressure of oxygen, FiO2 is the fraction of inspired oxygen, PATM is the atmospheric pressure, pH2O is the vapor pressure of water, paCO2 is the partial alveolar pressure of carbon dioxide and RQ is the respiratory exchange ratio [14,15]. We utilized atmospheric pressure measurements at the time of resuscitation as recorded by the respiratory function monitor NM3 (Respironics, Philips, Andover, MA). Where values were missing, the mean (SD) of measured pressures was used 701 ± 1 mmHg. We constrained the value for partial alveolar pressure of carbon dioxide and RQ to 40 mmHg and 0.8 respectively, based on accepted physiological generalizations [15,16]. The vapor pressure of water was constrained to 47 mmHg, an estimated value for vapor pressure at 37°C . The partial alveolar pressure of oxygen was the calculated for FiO2 of 0.21 and 1.0. The paO2 for each FiO2 was then multiplied by the resuscitation time for each piglet and the oxygen exposure values at each FiO2 were summed to total value for oxygen exposure during resuscitation. Statistical results are reported as mean (standard error of mean) and median (interquartile range - IQR) for parametric and non-parametric variables, respectively. ANOVA analysis was used to compare treatments groups if normality tests passed and rank-order analysis was to be used otherwise. Student t-test was used for analysis of the cumulative alveolar oxygen exposure between treatment groups. The Pearson Moment test was used to analyze the correlation between the individual assayed biomarkers. P-values are 2-sided and p<0.05 was considered statistically significant. Statistical analyses were performed with Sigma Stat (Sigma Stat, San Rafael, CA, USA). A total of 3/8 in the 3:1 C:V group versus 7/8 in the CC+SI group (p=0.0192), and 4/4 of the sham-operated piglets survived to 4-hour recovery. Time to ROSC was significantly decreased in the CC+SI group with 38 (23-44) seconds, compared to 143 (84-303) seconds in the 3:1 group (p=0.0008) . There was no difference in lactate levels measured in the left ventricle among groups: 0.96 (0.19), 0.89 (0.16), and 0.85 (0.11) μmol/mg protein for sham-operated, 3:1 C:V, and CC+SI groups, respectively (p>0.05) (Figure 2). Similarly, there was no difference in tissue lactate levels in the lungs with 0.16 (0.05), 0.24 (0.06), and 0.19 (0.02) μmol/mg protein for sham-operated, 3:1 C:V, and CC+SI groups, respectively (p>0.05) (Figure 2). The tissue myocardial glutathione content (GSH and GSSG) was similar among groups in the left ventricle (Table 1). The glutathione (GSSG/GSH) ratio in the left ventricle were 0.25 (0.03), 0.23 (0.01), and 0.29 (0.01) for sham-operated, 3:1 C:V, and CC+SI groups respectively (p>0.05) (Figure 2). Lung tissue glutathione content was not different among groups (Table 1) and glutathione ratios were 0.09 (0.02), 0.14 (0.03), and 0.05 (0.01) for sham-operated, 3:1 C:V, and CC+SI groups, respectively with a significantly lower GSH ratio in the CC+SI group (vs. 3:1 C:V group, p=0.047) (Figure 2). Figure 2. Tissue myocardial lactate (a) and GSSG/GSH ratio (b) in left ventricle, and tissue lactate (c) and GSSG/GSH (d) in the right lung. *p<0.05 vs. 3:1 C:V group. The alveolar oxygen exposure during resuscitation was calculated by using the total resuscitation time, which included the initial 30 seconds of positive pressure ventilation prior to CPR. The exposure time of 21% and 100% inspired oxygen was multiplied by the partial alveolar pressure of oxygen calculated based on the above-described formula. The calculated cumulative alveolar oxygen exposure results are presented in Table 2. The cumulative alveolar oxygen exposure during resuscitation in the CC+SI group was significantly lower compared to the 3:1 C:V group 27755 (4706) and 47729 (6692) mmHg seconds, respectively (Student t-test, p<0.001). We noted a modest but insignificant correlation between alveolar oxygen exposure and tissue total and oxidized glutathione content (r=0.63 and r=0.58; p=0.052 and p=0.079, respectively) but not between glutathione ratio and tissue lactate, in the lungs of asphyxiated piglets. We previously reported that CC+SI significantly reduces ROSC, improves hemodynamic, and minute ventilation [10,11]. In addition, we reported that oxygen delivery and epinephrine usage was significantly reduced. In the current study we examined if CC+SI would reduce hypoxic and oxidative stress injury. Tissue GSSG/GSH ratio, a reliable marker of intracellular oxidative stress and redox status was significantly increased in the lung of 3:1 C:V group. We observed a significant reduction in GSSG/GSH ratio in the SI+CC group compared to the 3:1 C:V group. In addition, the calculated cumulative alveolar oxygen exposure was significantly reduced in the CC+SI group. These findings indicated that 3:1 C:V group had higher oxygen exposure and increased oxidative stress, which potentially prolongs pro-oxidant status. Although we cannot categorically exclude increased oxidative stress in CC+SI group, it was lower compared to 3:1 C:V group. The positive correlation of oxygen exposure to glutathione ratio in the lungs is supportive of reducing oxidative stress through shortened resuscitation time, especially if supplemental oxygen is used during CC. In addition, tissue lactate levels, markers of hypoxic injury were similar among groups. Interestingly, we found no correlation between glutathione ratios and lactate levels. In the current study decreased resuscitation time correlated with reduced glutathione ratio in the lung, which supports resuscitation techniques that improve ROSC and reduce oxygen exposure during CPR have the potential to reduce oxidative stress. This is further supported by a study by Mendler et al. who investigated different ventilation strategies and found no significant effect of different respiratory support strategies during CPR on ROSC . This suggests that a combination of effective ventilation and CC-technique is required to improve ROSC [18,19]. With the data regarding oxidative stress reduction and lowered alveolar oxygen exposure without effect on hypoxic injury, we believe that the CC+SI technique has the potential to improve patient outcomes if translated to neonatal resuscitation. Possible confounders in this study could be related to the 4-hour recovery period, potentially masking larger differences in oxidative or hypoxic stress. The 4-hour recovery period may also have allowed physiological mechanisms to normalize the glutathione and lactate levels that could have been significantly different immediately following ROSC. While limited by the primary study design to monitor hemodynamic recovery, an alternative method for sampling of tissues immediately following ROSC may lead to different conclusions. This experimental model is strong with regard to translation as swine is a good model of neonatal asphyxia with similarities in physiological, biochemical, anatomical and developmental aspects, especially of the cardio-pulmonary system, between newborn humans and piglets [13,20]. The gradual onset of asphyxia is a good representation of the progressive nature of fetal distress that often occurs in utero prior to delivery . A limitation of the model is the completed fetal to neonatal transition, which differs to newborn babies in the delivery room. A further limitation is the small sample size, as we only had tissues for biochemical analysis from piglets that survived the 4-hour period. The 2010 guidelines in neonatal resuscitation recommend the use of 21% oxygen partly to reduce oxidative stress. 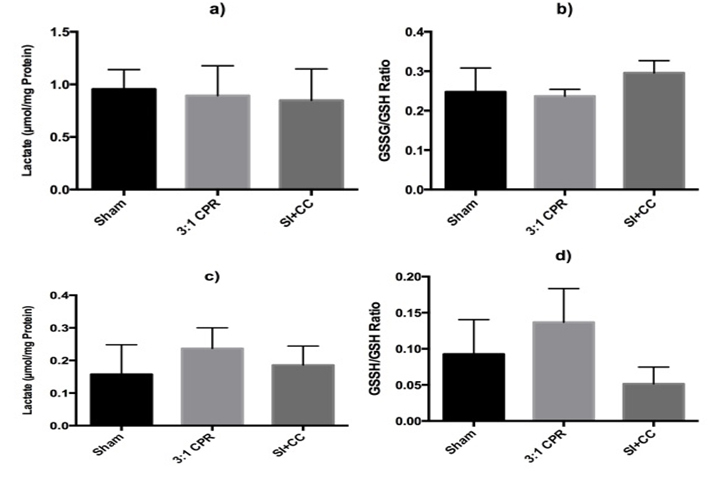 Our findings demonstrated that CC+SI resuscitation reduced the elevated lung glutathione ratio of piglets resuscitated by 3:1 C:V. The novel resuscitation method may further reduce alveolar oxygen exposure and lung tissue oxidative stress in asphyxiated neonates, in addition to the faster return of spontaneous circulation and improved hemodynamics. GMS is a recipient of a Banting Postdoctoral Fellowship, Canadian Institutes of Health Research and an Alberta Innovates - Health Solutions Clinical Fellowship. The study was supported by an operating grant to PYC from the Canadian Institutes of Health Research (MOP130483). Cruickshank S, Hirschauer N (2004) The alveolar gas equation. Continuing Education in Anaesthesia. Critical Care & Pain 4: 24-27. Widmaier EP, Raff H, Strang KT (2011) Vander's human physiology: the mechanisms of body function. McGraw-Hill, New York. Lee KT (1986) Swine as animal models in cardiovascular research. Biomed Res 3: 1481-1486. ©2016Cowan S. This is an open-access article distributed under the terms of the Creative Commons Attribution License, which permits unrestricted use, distribution, and reproduction in any medium, provided the original author and source are credited.